CASTING CALL: 2 Surfing Dogs needed for TV Commercial. A complete package for 4 medium to large Surf Dogs went out the next day. The producers narrowed it down to 2 dogs....Dozer and Hanzo. On April 1st there was an audition/practice held in Malibu. This was the first time Dozer's and Hanzo's owners, Doug and Eric, saw the very custom surfboard and learned what the commercial was all about. This also when they learned that they would not be surfing with their dogs but that in fact an actor would be. No one had ever surfed this surfboard with a dog before so the air was thick with anxiety. Both dogs rocked it and were invited back for the filming. 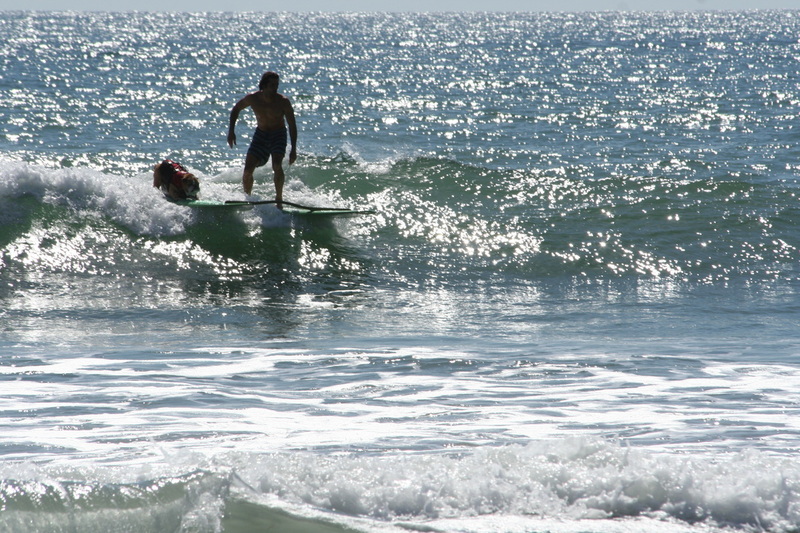 The commercial was filmed at Trail 6 at San Onofre State Park and at a house in San Clemente. As you can see, in the end they selected Dozer for the commercial.